Just when I thought I was in danger of becoming a jaded customer of the mass mapping space, here’s a site that effortlessly returns me to a state of slack-jawed wonder: HeyWhatsThat. What’s that, HeyWhatsThat? it’s an automatic summit-perspective generator for any peak in the continental US. 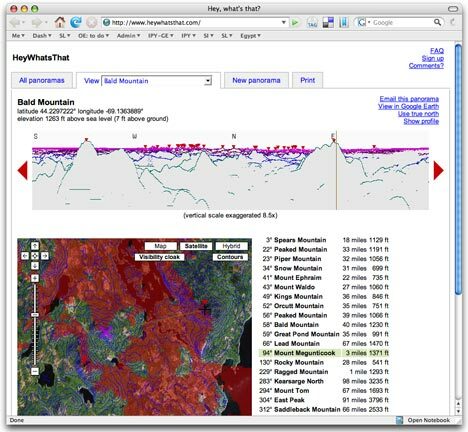 You can request the view from any mountain top, and HeyWhatsThat will use a database of summits and a DEM to show you what the view looks like from there, and annotate it for you. But that’s just the beginning. You can click anywhere on the horizon of the generated view to see its corresponding spot on Google Maps. Then, click on “show profile” to show the elevation of the path from the summit to that point. You can turn on a “visibility” cloak in Google Maps which paints red all those areas that are visible from your perspective. And you can also turn on contours on Google Maps. 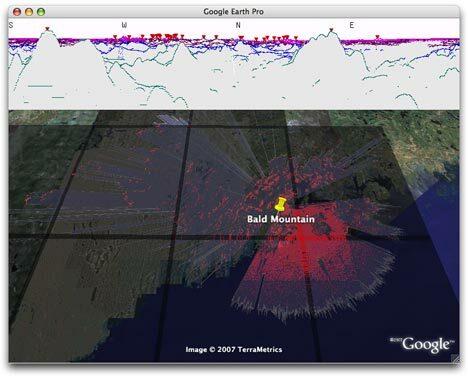 Then, click on the Google Earth link for a head trip. You get a network link showing all public panoramas. Turn one on, and you get an automatically generated overlay showing all visible areas from that summit in red, and an overlay showing the extent of your horizon. If you think this is too good to be true, as I did, just zoom on in onto the summit, and have a look around — everything is in red, just as it should be from that perspective. If you request your own panorama, the options are very well thought out. For example, when you choose a location on the map, you get given the opportunity to move to the highest nearby spot, so that you don’t accidentally get a generated view from just below the summit. Very nice. Yet another example of how “lightweight” “consumer-facing” map interfaces can be integrated with web services that do, gulp, real spatial analysis! And can I assume there’s no “real” proprietary GIS software in the stack? Following up on S’s comment, there’s a Flickr group devoted to side-by-side comparisons of real landscape photos and their corresponding GE views. IT missed the BIG one on the first view I looked at. Queen Anne Hill in Seattle is famed for its view of Mt. Rainier, 14,410 feet (and the Space Needle). HewWhatsThat missed it. It shows it and lists about 40 summits, only two of which are half Rainier’s height, but it doesn’t list Rainier. Well that sure opened a whole can of worms. We’ve now rerun that panorama here, having loaded newer data and fixed a bug that I honestly don’t think we’d have ever come across without this test case, involving a peak occluding another then vanishing a bit too quickly. Not only will you now see Mt. Rainier, but you also get its neighbor Liberty Cap at no extra charge! You can’t at the moment — but there is a plugin for NASA World Wind that lets you do this.